The hottest new game console is here and you can get it free when you enter to win here. The Nintendo Switch is designed to go wherever you do, transforming from home console, to handheld, to tablet in a snap so you can set up and play anywhere you are. No need to pull together controllers and cables into a bag and lug it over to your friend's house - it doesn't get more portable than Switch. Go on epic solo adventures in games like The Legend of Zelda: Breath of the Wild and Super Mario Odyssey, or face off against other Switch-wielding friends in multiplayer action. A universe of gaming fun awaits you - all you have to do is enter today. Nintendo is not affiliated with this contest. This promotion is in no way sponsored, endorsed or administered by, or associated with, Facebook. You are providing your information to StackCommerce, Inc. and not to Facebook. NO PURCHASE NECESSARY TO ENTER OR TO WIN. 1. Eligibility. 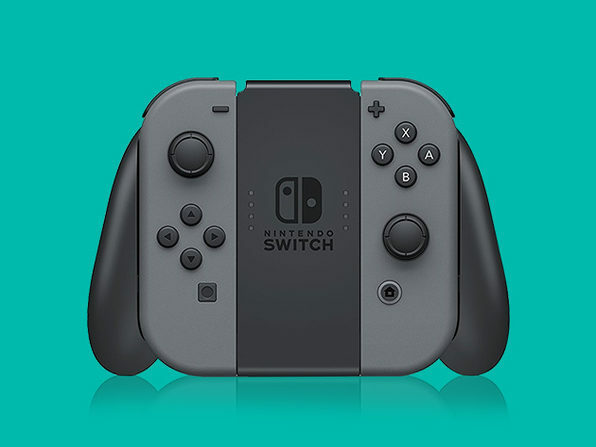 Subject to the additional restrictions below, the StackCommerce The Nintendo Switch Giveaway Sweepstakes (“Sweepstakes”) is open to all legal residents of the United States who are eighteen (18) years of age or older as of the date of entry. For purposes of these Official Rules, all times are Pacific Standard Time (PST). Employees or agents of StackCommerce, Inc. (“StackCommerce”) and co-sponsors of the Sweepstakes (if any) and their respective affiliates, subsidiaries, advertising/promotional agencies, and the members of their immediate families (i.e. parents, children, siblings or spouse) or those persons living in the same household of such individuals are ineligible to enter or win. The Sweepstakes is subject to all applicable federal, state and local laws and regulations. Void where prohibited by law. Participation constitutes entrant’s full and unconditional agreement to these Official Rules, any terms that apply to your use of Facebook’s policies and procedures (to the extent you seek Additional Entry per below) and any other terms that apply to your use of Facebook and Sponsor’s decisions, which are final and binding in all matters related to the Sweepstakes. Winning a prize is contingent upon fulfilling the eligibility requirements set forth above and below. 2. Sponsor(s): StackCommerce, Inc., 21 Market Street, Los Angeles, California 90291 and any co-sponsors shown on the dedicated Sweepstakes page at StackCommerce.com (collectively referred to hereafter as “Sponsor”). 3. Sweepstakes Term. The Sweepstakes will end at 11:59 PM PDT on 06/30/17 (the “Sweepstakes Term”). Sponsor’s computer is the official time keeping device for the Sweepstakes. 4. How To Enter. You may enter the Sweepstakes by visiting by following all onscreen instructions to complete and submit the online entry form (“Primary Entry”) on the dedicated Sweepstakes page. You can earn an Additional Entry in the Sweepstakes when you send the Sweepstakes page to a friend, age 21 or older, by following the Additional Entry instructions on the screen (“Additional Entry”) and the friend enters the Sweepstakes inputting your referral information. No other methods of delivery will be accepted, including submission by email. ALL ENTRIES MUST BE SUBMITTED DURING THE SWEEPSTAKES TERM. All entries become the exclusive property of StackCommerce and will not be acknowledged or returned. Winner will be selected at random. By entering, you agree to the terms of these Official Rules and to receive newsletters via electronic mail from the Sponsor or those directed by Sponsor (see Section 12 below for more details). StackCommerce is not responsible for incomplete, lost, damaged, forged, stolen, postage due, late, undeliverable, misdirected, illegible entries or for failure to receive entries due to transmission failures or technical failures of any kind, including, without limitation, malfunctioning of any network, hardware or software originating with StackCommerce. Any attempt by any entrant to obtain more than the stated number of entries by using multiple/different email addresses, identities, registrations and logins, or any other methods will void that entrant’s entries and that entrant may be disqualified. In the event of a dispute, all online entries will be deemed to have been submitted by the owner of the ISP account from which they were sent. For these purposes, an ISP account holder shall mean the natural person assigned to such ISP account by the Internet access provider, online service provider or other organization responsible for assigning ISP addresses for the domain associated with such ISP account. Any questions regarding the number of entries submitted or the owner of an ISP account shall be determined by StackCommerce in its sole and exclusive discretion, and StackCommerce reserves the right to disqualify any entries by persons determined to be tampering with or abusing any aspect of the Sweepstakes. 5. Prizes & Approximate Retail Value. A total of $299 prizes will be awarded to winners selected at random. One Grand Prize is available, to be given away. The Grand Prize consists of: A Nintendo Switch with an approximate retail value (“ARV”) of $299.99. StackCommerce’s decisions as to the administration and operation of the Sweepstakes and the selection of the potential winner are final and binding in all matters related to the Sweepstakes. The potential winner will be notified immediately via email or through Facebook. The award of prizes exceeding a retail value of $600 is subject to applicable withholding requirements and the winner will receive an IRS Form 1099 reflecting the actual final retail value of the prize. Where permitted by law, the potential winner will be required to sign and return to Sponsor(s), within seven (7) business days of the date the notice is sent, an affidavit of eligibility and liability/publicity in order to claim their prize. If a potential winner cannot be contacted or fails to sign and return the affidavit of eligibility and liability/publicity release within the required time period, the potential winner forfeits the prize, unless prohibited by law. Receipt of a prize by a potential winner is contingent upon fulfilling all requirements described herein. The winners must continue to comply with all terms and conditions of these Official Rules after prize notification. In the event that a potential winner is disqualified for any reason, StackCommerce will award the applicable prize to an alternate winner by random drawing held by Sponsor from among all remaining eligible entries received during the Sweepstakes Term. Prizes may not be transferred or assigned except with Sponsor’s written consent. 6. Odds. The odds of winning a prize is equal to the number of Sweepstakes prizes divided by the total number of entries to the Sweepstakes. Entrants agree that StackCommerce, Facebook, and any other Released Parties shall not be responsible or liable for any losses, damages or injuries of any kind resulting from the Sweepstakes or any Sweepstakes-related activity (including any travel or events related to prizes awarded). StackCommerce, Facebook, and any other Released Parties assume no responsibility for any damage to an entrant’s computer system which is occasioned by accessing or participating in the Sweepstakes, or for any computer system, phone line, hardware, software or program malfunctions, or other errors, failures, delayed computer transmissions or network connections that are human or technical in nature. In the event StackCommerce is prevented from continuing with the Sweepstakes (or awarding any prize) as contemplated herein by any event beyond its control, including but not limited to fire, flood, earthquake, explosion, labor dispute or strike, act of God or public enemy, or any federal, state or local government law, order, or regulation, or other cause not reasonably within StackCommerce’s control (each a “Force Majeure” event or occurrence), then subject to any governmental approval which may be required, StackCommerce shall have the right to modify, suspend, or terminate the Sweepstakes. 8. Publicity. Except where prohibited by law, participation in the Sweepstakes constitutes winner’s consent to Sponsor’s and its agents’ use of winner’s name, likeness, photograph, voice, opinions and/or hometown and state for promotional purposes, in any and all media worldwide, for any purpose and without further payment or consideration, including without limitation, commercial, advertising and promotional purposes as well as in, on or in connection with Sweepstakes or other promotions, and hereby releases StackCommerce from any liability with respect thereto, unless prohibited by law. 9. Participation. By entering this Sweepstakes, entrants agree to be bound by these Official Rules and the decisions of StackCommerce. If the potential winner declines the prize, fails to claim the prize, is unavailable for prize fulfillment, fails to abide by the Official Rules, or is ineligible, StackCommerce may randomly select an alternate winner from all remaining eligible entries. StackCommerce reserves the right to disqualify persons found tampering with or otherwise abusing any aspect of this Sweepstakes as solely determined by StackCommerce. StackCommerce is not responsible for any non-intentional, incorrect or inaccurate information associated with this Sweepstakes or for any technical or human error that may occur in the administration of this Sweepstakes. In the event the Sweepstakes is compromised by a virus, non-authorized human intervention, tampering or other causes which corrupts or impairs the administration, security, fairness or proper operation of the Sweepstakes, StackCommerce reserves the right in its sole discretion to suspend, modify or terminate the Sweepstakes. Should the Sweepstakes be terminated prior to the stated expiration date, StackCommerce reserves the right to award prizes based on the entries received before the termination date. The winner releases Sponsor and their affiliated companies from any claims, costs, expenses or liability incurred by winner in connection with this Sweepstakes or winner’s acceptance and use of the prize, including any travel related thereto. StackCommerce’s failure to enforce any of these Official Rules shall not constitute a waiver of that provision. LEGAL WARNING: ANY ATTEMPT BY AN INDIVIDUAL, WHETHER OR NOT AN ENTRANT, TO DELIBERATELY DAMAGE, DESTROY, TAMPER OR VANDALIZE THIS WEB SITE OR INTERFERE WITH THE OPERATION OF THE SWEEPSTAKES, IS A VIOLATION OF CRIMINAL AND CIVIL LAWS AND STACKSOCIAL RESERVES THE RIGHT TO SEEK DAMAGES AND DILIGENTLY PURSUE ALL REMEDIES AGAINST ANY SUCH INDIVIDUAL TO THE FULLEST EXTENT PERMITTED BY LAW.
. Please review carefully as those procedures require binding arbitration (in most instances) and waive any class action rights. You acknowledge and agree that those procedures provide your sole and exclusive avenue for resolving disputes related to the Sweepstakes. 14. Winner List. For a copy of the name of the winner(s), available after 11:59 PM PDT on 06/30/17 + 1 month, 2016, or a copy of these Official Rules, send a self-addressed, stamped envelope to, StackCommerce, Inc., Attn: “Winner List/Official Rules” for The Nintendo Switch Giveaway 21 Market Street, Los Angeles, California 90291. 15. Facebook Disclosures. The Sweepstakes is in no way sponsored, endorsed or administered by, or associated with, Facebook.